Description of "How to study a difficult subject? (eBook)"
Students find a few subjects too difficult that they do not know what to do. Some students feel that a few papers in entrance exams are very tough to manage. This book is for such students. The techniques outlined here have been tested time and again on several batches of students and there has been a tremendous positive response to the method. Research has also been conducted with regard to the veracity of the method and the results have been published in an international journal. Rather than struggling to understand and remember the information these difficult subjects have, it is always better to use a different and workable approach to solve problems. I hope this book is able to bridge this gap. Dr. Sujendra Prakash holds a Ph.D. degree in Psychology from Bangalore University. During his extensive professional career, he has held senior academic positions in several colleges. He has taught graduate and post-graduate students in various subjects of psychology. Dr. Prakash is a professional member of Indian Academy of Applied Psychology, Chennai; Indian Society for Training and Development, New Delhi; Associate life member of Karnataka Association of Clinical Psychologists; and was an affiliate of Consulting Psychology Division of the American Psychological Association during 1999-2001. He has published and presented several papers and he has been interviewed on burning issues in Times of India, Bangalore and other newspapers. He has also been interviewed in several TV and radio channels. He was invited to be a celebrity in Indiatimes.com in 2002. He has counseled and helped thousands of people in developing memory, concentration, study skills, personality development, etc. He has several corporate and institutional clients. 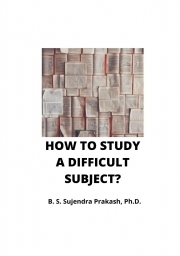 Reviews of "How to study a difficult subject? (eBook)"